Samantha Donnelly's practice is primarily sculptural. She has a materials-led approach to making, underpinned by references to art history and popular culture - specifically photography, TV, film and advertisements. Born in Manchester in 1978 and currently living and working in Berlin, Germany, her most recent solo exhibition, 'Contour States' explores representations of female identity in photography, TV, film and advertisements. 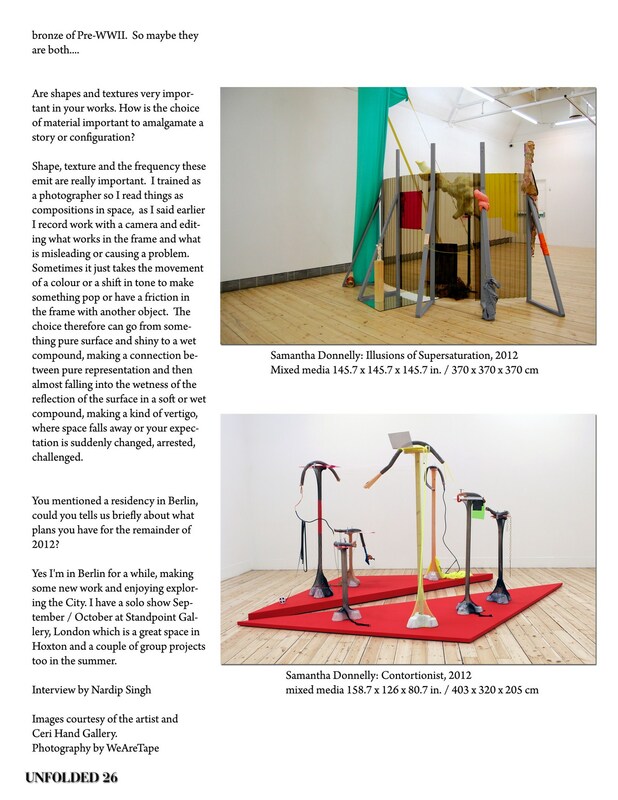 We asked Donnelly how important has it it been to construct the 'Contour States' installation with a view to engage and question those views? I feel that throughout the show a pluralism and openness permeates, allowing the audience to make interpretations and be active in constructing their opinion of the work. There are visual and written connections to news-stories / art history and critical theory - which are possibly not the most prevalent thing one would see (this I suspect would be colour, shape or form) - but these are weaved into a larger structure. Maybe a more careful reader, or one whom has a specific political identity, or was in some way expert, will read the work in a very different way. I'm happy for that to happen, but also I feel that its important to not exclude people from having a viewing experience and so there are many levels to connect with the work on. Ultimately Art for me is a place where the individual interpreting the work is extremely important, and I feel as an Artist I should facilitate and open out possibilities where discourses or ideas may or may not form in the audience. How do you go about assembling your work and sourcing inspiration and materials for your installations? I'm a collector and I have a large archive of fabrics, jewellery, old magazines and stuff where some of the unique found-objects come from, most of which have some kind of personal story or history with them; from where they were bought to who was with me when I came across the object, that kind of thing. I guess I would describe these as delicate or having some kind of sentimental value. A large part of the other materials are from DIY or home improvement stores, so these objects - such as bricks or carport roofing - have a completely different aesthetic, one which is robust, tough and functional. The assembling happens over a long period of time, gathering parts along my way and casting plaster / forming ceramics. For this particular show at Cornerhouse in Manchester, 'Contour States', I had a strong visual picture in my mind of how the elements of each piece of work would connect and be placed. I did a long install period of around two weeks in the gallery, where most things fell into place. There were some changes and some surprises along the way, but that always happens when its on site, as suddenly you have to deal with the things which you hadn't factored for. I guess the way I think about assembling is rather musical or related to poetry or writing where there are moments of intensity followed by lapses and stillness. I also take hundreds of photographs during the install which I then revise on my laptop off-site, this distanced way of editing, helps me to flatten out the objects in space and so I can get a sense of where the composition fails or needs attention. It has been said that you break down subjects and reconfigure them in new constellations. 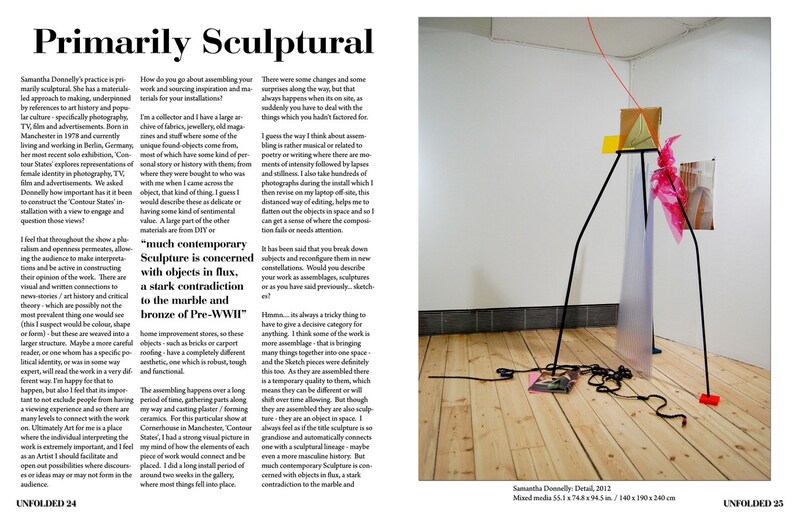 Would you describe your work as assemblages, sculptures or as you have said previously... sketches? Are shapes and textures very important in your works. How is the choice of material important to amalgamate a story or configuration? Shape, texture and the frequency these emit are really important. I trained as a photographer so I read things as compositions in space, as I said earlier I record work with a camera and editing what works in the frame and what is misleading or causing a problem. Sometimes it just takes the movement of a colour or a shift in tone to make something pop or have a friction in the frame with another object. The choice therefore can go from something pure surface and shiny to a wet compound, making a connection between pure representation and then almost falling into the wetness of the reflection of the surface in a soft or wet compound, making a kind of vertigo, where space falls away or your expectation is suddenly changed, arrested, challenged. You mentioned a residency in Berlin, could you tells us briefly about what plans you have for the remainder of 2012? Yes I'm in Berlin for a while, making some new work and enjoying exploring the City. I have a solo show September / October at Standpoint Gallery, London which is a great space in Hoxton and a couple of group projects too in the summer. Images courtesy of the artist and Ceri Hand Gallery.